January: We made "Adorable Aliens"
March: I shared some of my favorite recipes from my "Crockpot Goodness" Pinterest board. 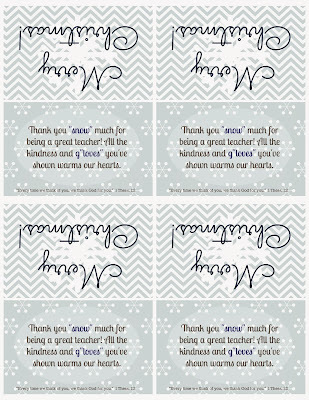 April: I put together these "Teacher Thank-You Handsoap Sets". May: I threw Carson a "$25 Birthday Party". June: More teacher thank-yous: "Cute Coaster World Carnival Favors"
July: I loved the "Wedding Day Candy Bar" from my sister's wedding so much, it got its own post! August: I finally blogged these fun "Art Party Krispy Treats". September: I helped decorate for this fun "Raindrops and Sprinkles Baby Shower". 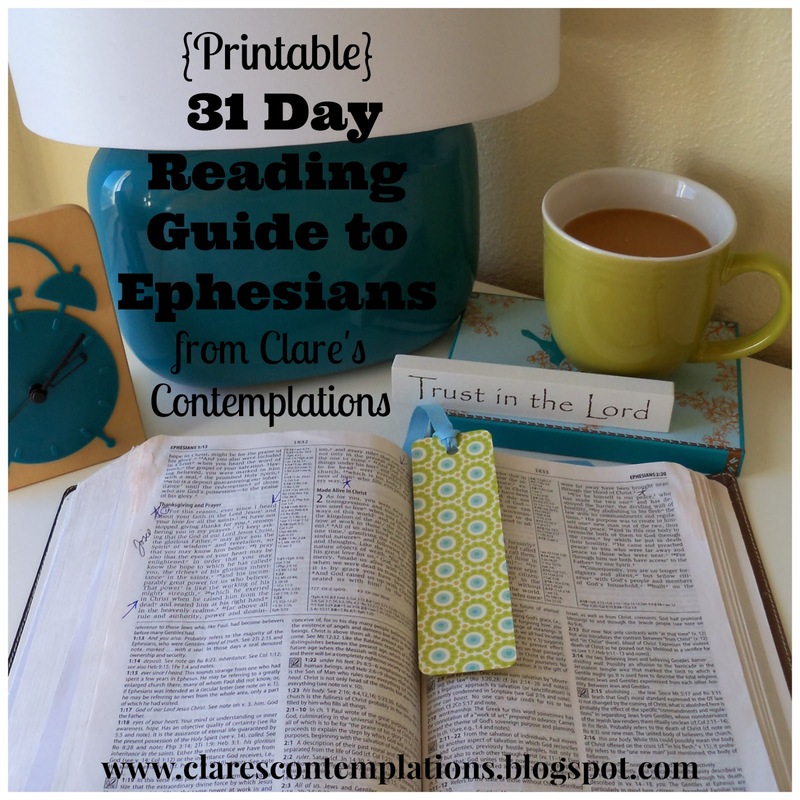 October: I blogged for 31 Days! This was a huge accomplishment. 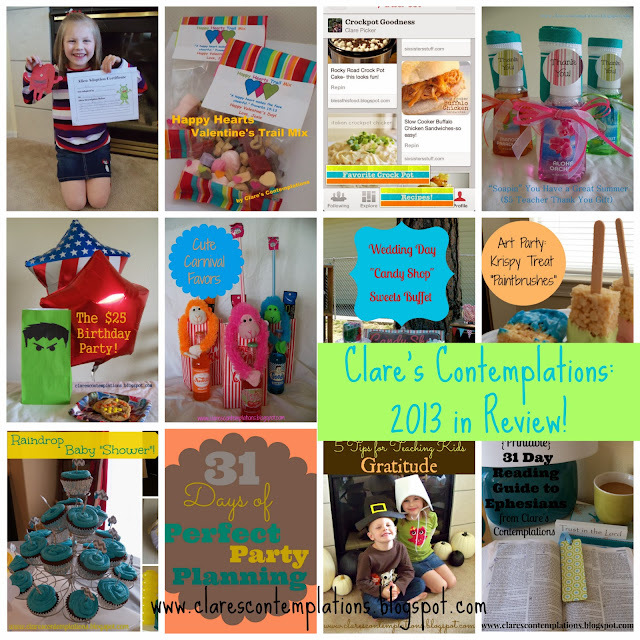 I loved the whole "31 Days of Perfect Party Planning" series. November: I talked about "Teaching Kids Gratitude" just in time for Thanksgiving. December: This is definitely the post I am the most excited about: I created a "31 Day Reading Guide to Ephesians" and shared it just in time for the New Year! 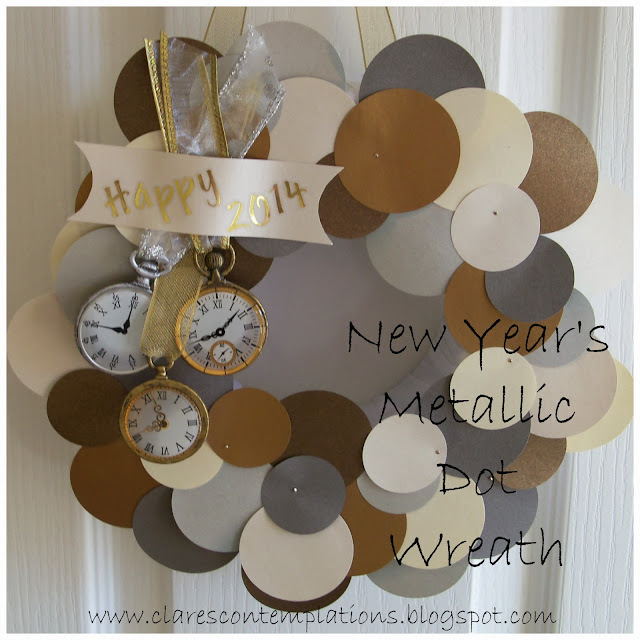 I posted about this New Year's metallic dot wreath I made last year, and I pulled it out again to decorate with this year! It was so easy to update it- I simply pulled off the "3" and since I saved my stickers from last year, I just added a "4" instead! The wreath saved beautifully, and I am still in love with the metallic colors- they are such a refreshing change from the bright, sometimes overwhelming colors of Christmas! I love to leave it up the whole month of January. If you would like to make one, it will cost you about $5 and only take about 20 minutes, and you can find the whole tutorial here! I feel like the poor New Year is overlooked after Christmas, so it deserves some special New Year's decorations of its own! 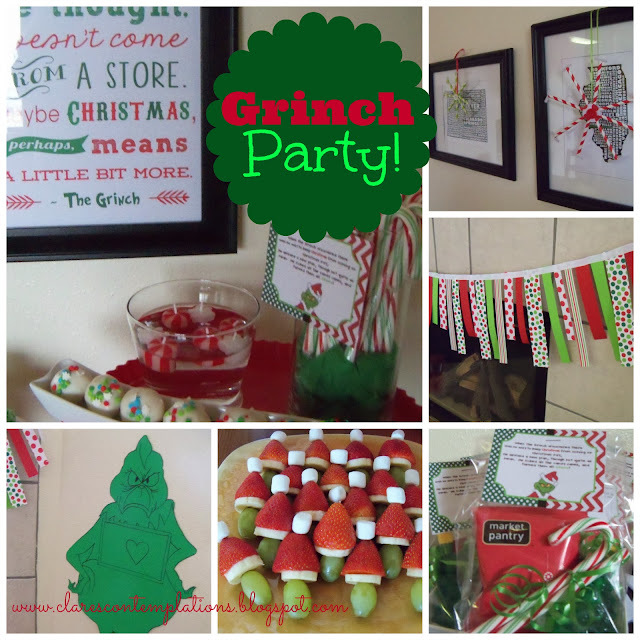 I have wanted to have a Grinch party for a while now. It has long been one of my most favorite Christmas movies. My friend Sarah and I talked about it, and we agreed that it was a holiday necessity. However, we all know how crazy this time of year is, so we didn't want anything over the top that required too much time or money. I decided that I would not make any decorations before the party day-I put everything together this morning, the only thing I did beforehand was shop and make the cookies. I used a great recipe I got from my sister for "Gooey Butter Cookies" and simply added green food coloring. Oh, and I had already made these "Cake Batter Truffles" a few days ago, so I just put them in a pretty white dish! One of my favorite decorations was this paper garland. I literally put it together in about 15 minutes! I had some paper strips left over from my wreath (yes, I am a scrapbook paper hoarder!) and then I cut a few more on my paper cutter. I didn't worry about the widths or lengths, I wanted them to be varied. Then I hot glued them onto a ribbon, randomly choosing strips. It turned out so cute! I made the tulle pom-poms for Josie's birthday (I plan on sharing that next month!) and they were just perfect for this party. I printed off this Grinch printable and used some ribbon to make the frame longer for hanging. Then put green striped candy canes in a vase with this printable on the front, and a little green tissue paper in the bottom. I put my truffles in an olive dish and a few floating candles in a glass bowl and put everything on cake stands. My peppermint tree worked with the color scheme so I put it on there, too. My friend Sarah put together these cute "Grinch" fruit kebabs. The kids loved them! 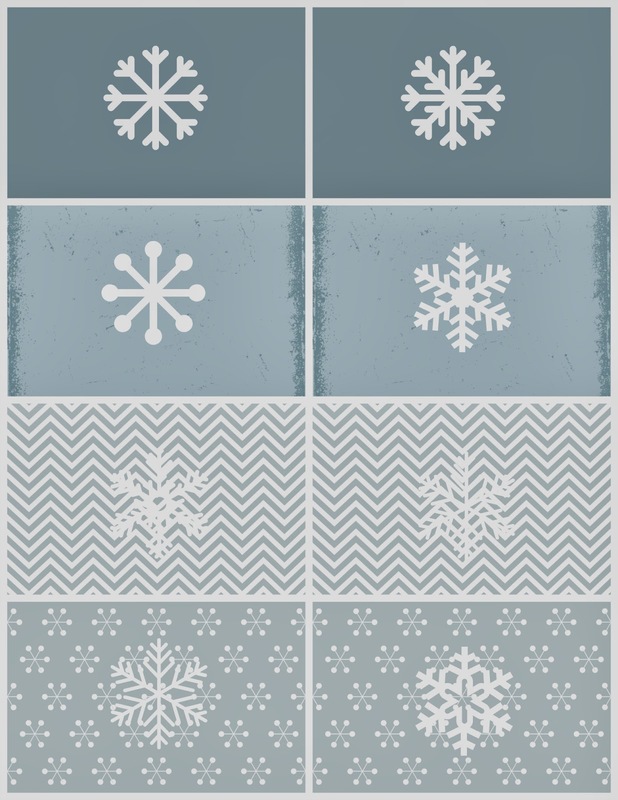 I taped my "Paper Straw Snowflakes" over the pictures on my wall. They were the right color, too. I love this kind of decorating- simple, easy and cute. I put everything up in about an hour, and that included printing the printable, and making the garland! The best decoration isn't one I made. Sarah's talented husband drew this amazing Grinch free-hand so the kids could play "Pin the Heart on the Grinch". He looked so great on the wall! The kids had a great time trying to get the felt heart onto the right spot. And doesn't the Grinch look like he needs a heart (or 6)?! I put together this "Melt the Grinch's Heart" game. I used cherry Runt candies (not only do they look like hearts, but they are the right color). I made put them in ice cube trays filled with water dyed green. The water did mostly remove the color from the candies, though! I told the kids they could use any part of their bodies to get the candy free from the ice. They were kind of hilarious! They really enjoyed it, and I provided several towels to warm and dry their hands with. Their reward for getting the candy out was another heart candy. The favors were the last part. So easy and cheap, too! I had a coupon so I got the Market Pantry reindeer grahams from Target for $1. Just like Max the "reindeer"! The tree shaped bubbles were $0.75 for two at Target-just like the trees the Grinch stole. And then I tied two green striped candy canes with a little curling ribbon. 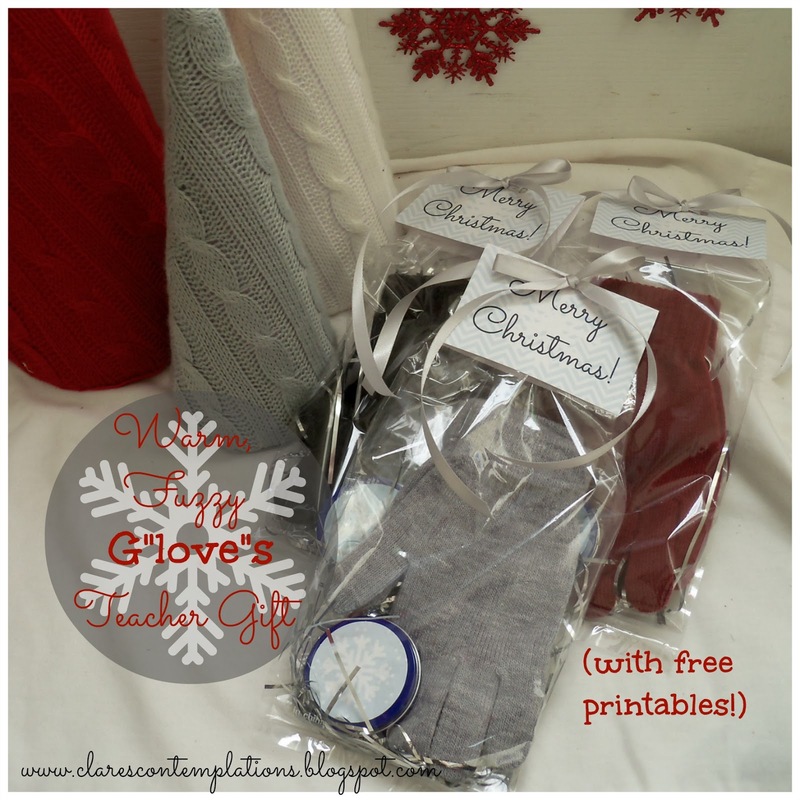 I used more of the Grinch candy cane printables to top cellophane bags with! I love having favors and these were so simple and inexpensive, less than $1 each! I forgot to take photos of the "green" hot chocolate I made. I used this "White Peppermint Hot Chocolate" and it was delicious! We topped it with whipped cream, snowman marshmallows and sprinkles. The kids had a "teeny" sugar high, but it was worth it. We munched all the goodies while watching the classic "Grinch" movie and it was just delightful. We decided that this little party definitely needs to be an annual event. It was just perfect for the holidays-easy, fun, and low-key. I think Sarah and I liked it almost as much as the kids! 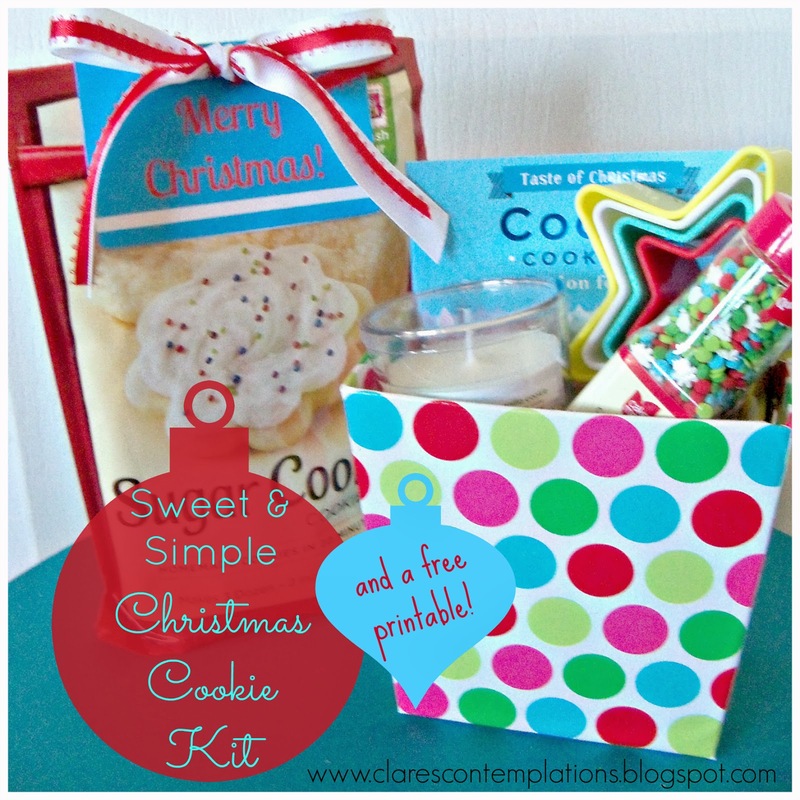 Sweet and Simple Cookie Kit Gift-with Free Printable! I have another easy gift idea for you- and another printable! This little cookie kit can be put together with just a few inexpensive items from Target or Walmart, but it makes a sweet, thoughtful gift for a teacher, neighbor or friend! It is perfect for a last minute gift, since you don't have to make anything. -"Cookie Cookbooks" from Mardel. These little books are so cute, and they were only $2 each. 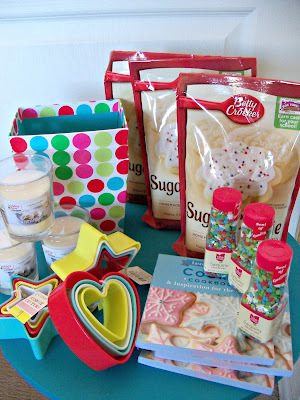 -Cookie cutter sets from Target. Dollar Spot score! 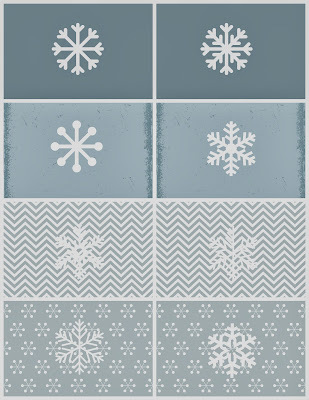 -some ribbon to tie your printable on with. Even if you don't want to make the cookie kits, you could put this little tag on any kind of homemade treat! Since they don't specify what is inside, you can use them however you want. And, since they don't have a particular recipient on them, you can use them for teacher gifts, neighbor gifts, or just whoever! I printed the labels, folded and then placed them at the top of the cookie mix packages. I punched two holes (be careful to punch at the very top of the bag, on the sealed part, so you don't puncture the part with the mix in it!) and then I tied ribbon into a bow. There are lots of other fun things you could add to your gift, or you could make a homemade mix, but I was going for frugal and easy, so all my items are store-bought. However you do it, it will still be a cute and thoughtful gift! Mine ended up being around $6 each. 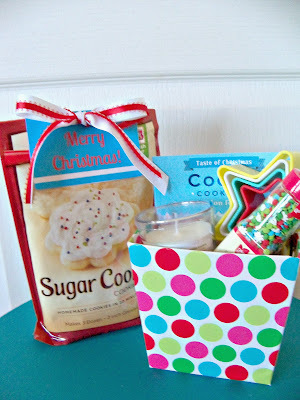 I always think that homemade gifts are lovely, and it would have been fun to have given cookies that I had baked, but time is short, and I thought these would be fun for the recipients to use with their families. 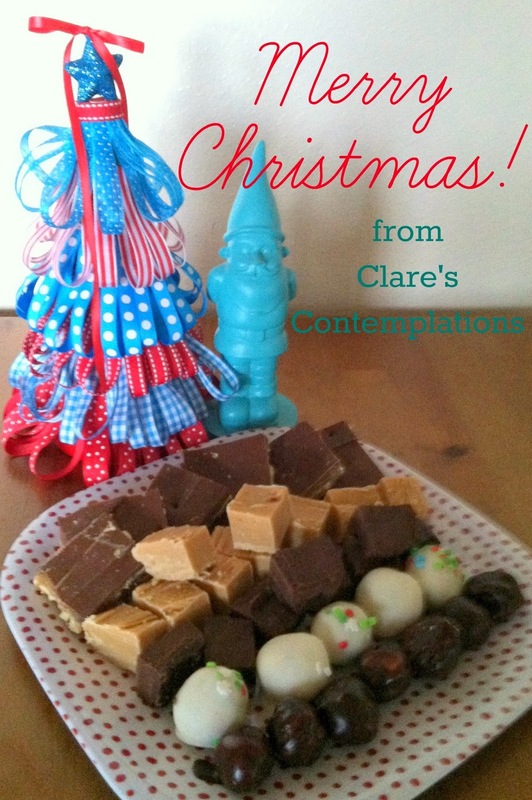 They can be also be used after Christmas, when everyone isn't completely inundated with homemade treats anymore! The last time I made a holiday wreath for my door, it was this one. My style has changed a *lot* since then, and it was really time for an update. I made this paper Christmas wreath, but it wasn't suited for my front door, it was a little too fragile. I love Christmas, but I decided that you could definitely leave this wreath up past Christmas, even up to Valentine's Day if you wanted to, so "holiday" wreath was an appropriate term. However, if you prefer, you can definitely call it a Christmas wreath! This is one Christmas wreath that is fast, fun and cheap! You can get started after a quick trip to the Dollar Tree and Hobby Lobby. -5 red feather boas from the toy section at the Dollar Tree. They may not look like much, but once you shove them on the wreath form, they will look much more expensive! -a wreath form, I used an 9.5 inch extruded foam one, but those are kind of pricey (about $4 at Hobby Lobby), you could definitely use a cheaper foam one, or even a straw one. The fluffy feathers cover a multitude of flaws! -embellishments, if you want. It looks just as good plain! I used a snowflake ornament from Walmart that was $0.98. I have three in the photo, but I only ended up using one. I also ended up adding some ribbon. - a lint roller. This is not a joke-you will get "fluff" everywhere, and this will make clean up much easier! To get started, find the end of one of your boas. All the ones I bought had yarn loops at the end, so it made it really easy to pin it into the wreath form. I made sure to keep all my pins on one side so that it had a "back". Push the pin securely through the yarn and into the form. Start looping the boa securely around the wreath. Don't pull too tight-you don't want to damage your feathers and pull it apart. Push each loop together to cover the form completely. Once you reach the end, secure that yarn loop and start another boa next to it. 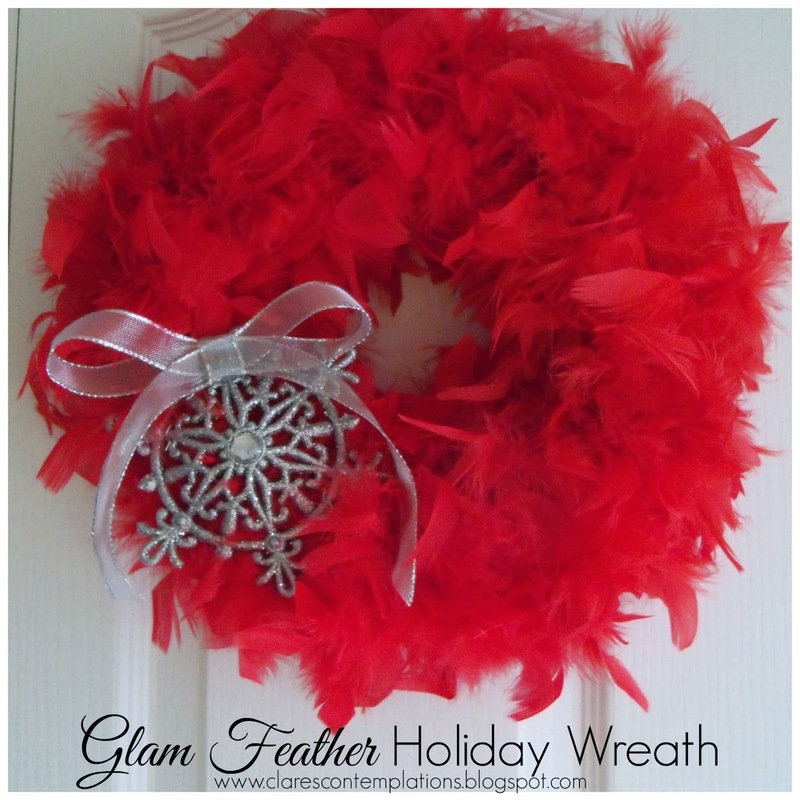 In less than 10 minutes you will have a fabulously feathery glam Christmas wreath! You can stop here, or you can embellish it. I removed the hanging loop from my ornament, and then I secured it with three floral pins-make sure you are pushing these into the wreath form, and not just the feathers! If you look closely at the photo, you can see the pins. I then attached a simple bow to the top. This is the part where you will want the lint roller. See all the feather bits? Once it is clean, you can enjoy your lovely "Glam Feather Holiday (or Christmas) Wreath! "Be Inspired" at Elizabeth & Co. This week has had two special blog "firsts" for me. I shared my first printable! That was very exciting. 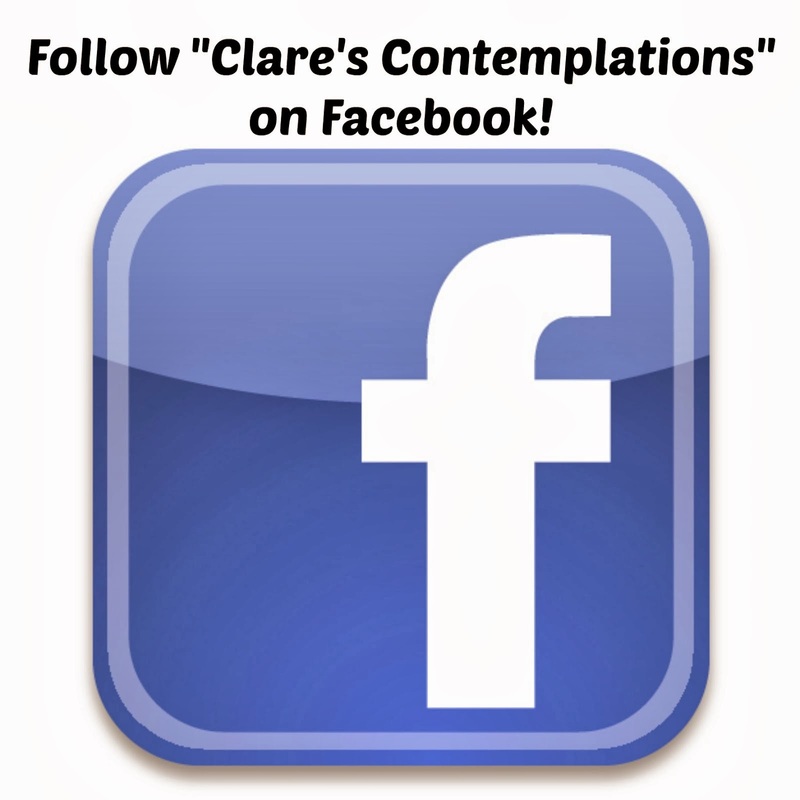 And today, I am guest posting for the first time ever! Anne, of "Planting Sequoias" graciously agreed to share her little corner of the blog world with me today. 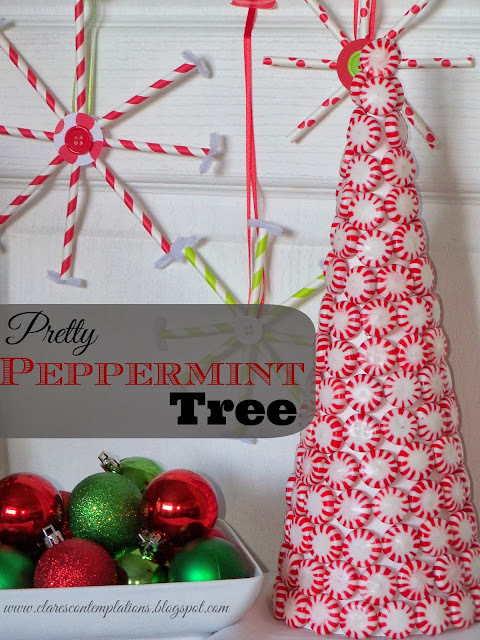 I shared a post about a whimsical peppermint tree I made! P.S. (updated as of 12/4/14) I had people ask about how well it would store. True story: I packaged mine in clear wrap, and then carefully bundled it in packing paper and put it with my other decor in a Rubbermaid container. We moved over 800+, stored it in a shed for 6 months, I schlepped it to our new apartment, and opened it, thinking for sure it would be ruined. Nope! It stood up like a champ! It had lost two candy pieces, which I hotglued on, and it is proudly standing on my bookshelf. You can definitely store this-I didn't even shellac mine. Love this thing! Warm,Fuzzy (Gloves!) 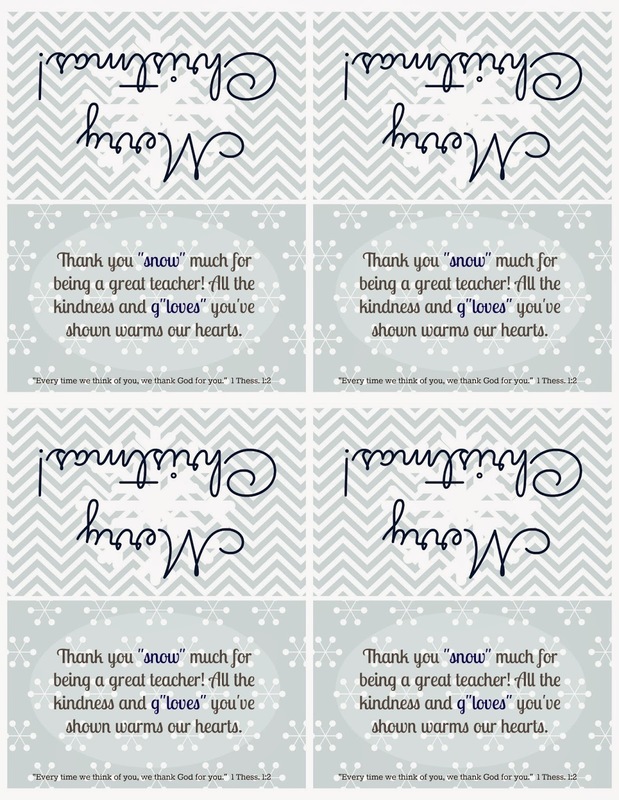 Teacher Gift-with a Printable! 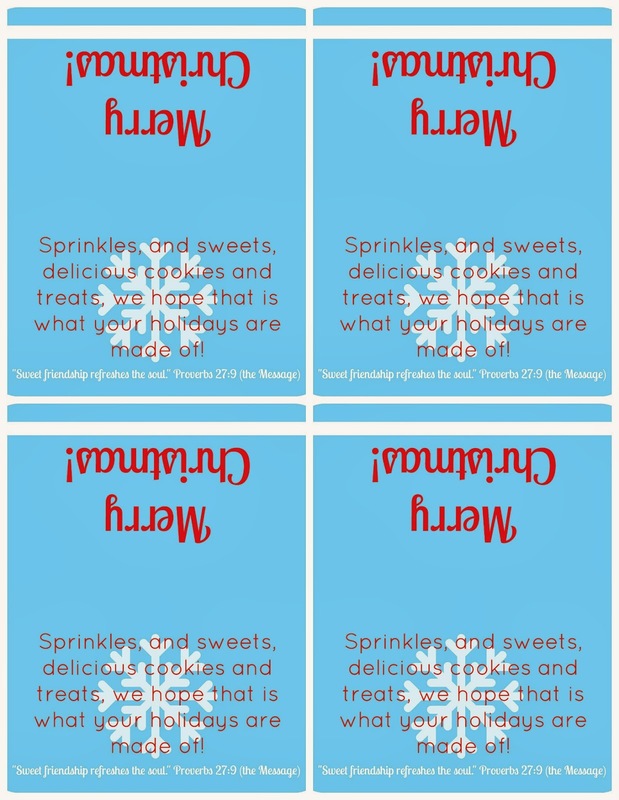 This little gift comes together in a snap (since you don't have to play around with making printables!) and it costs less than $5! I wanted to give something useful and calorie-free to my kids' church teachers-and since touchscreen compatible knit gloves (yes, I'm an iPhone junkie!) are on my own Christmas list this year, I decided that was just the thing! -Nivea lotion tins, I specifically chose these because 1. I love the lotion, its terrific. 2. I knew they would be a good fit for a 2 inch hole punch! Bonus: they are only about $0.89 each. 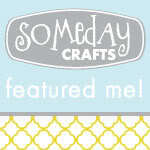 - my printables! 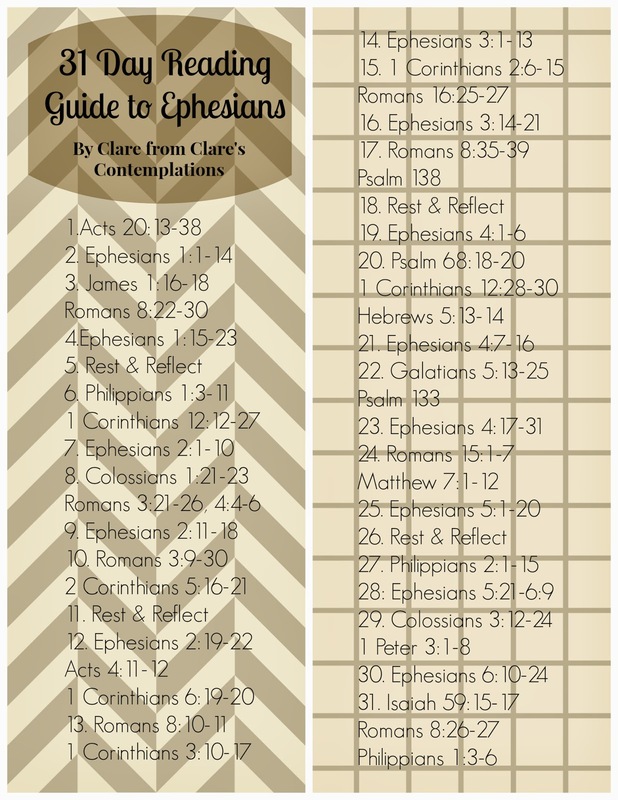 Simply right-click on the image to download and save, then right click on the image to print. Chose regular paper size (8.5x11) to print the right size for both images. The bag toppers are super easy, simply cut off the extra white paper around each topper and fold along the line in the middle. 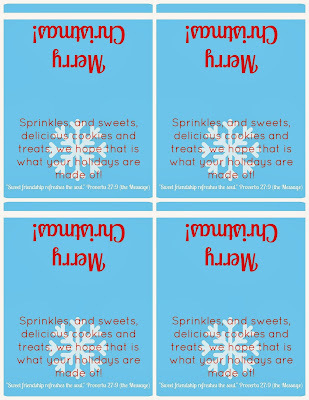 It looks like half of the topper prints "upside down" but it will be right-side up when it is folded. "Thank you "snow" much for being a great teacher. All the kindness and g"loves" you've shown warms our hearts." The small print says, "Every time we think of you, we thank God for you." 1 Thess. 1:2. The lotion toppers can be used for a variety of things-I think they would make cute gift tags, even. To use them for the lotion, cut the rectangles apart, you don't need to do this with any precision. Center your punch opening over the snowflake and punch. You will have a perfect circle that fits great on your lotion tin! I also discovered that this fit great on top of Nivea's "lip butter" tins- so if you are looking for another gift option, this is cute, too. I placed four tiny glue dots on each punch and stuck it on top of the tin. It will be easy to remove, but it looks cute in the packaging. I added some silver "foil shreds" to the bag and then placed the gloves and lotion tin inside. I needed to slightly fold in the sides of my bag, I taped them down. Then I added the topper and punched two holes centered near the top, and then tied a bow with some ribbon. All ready to say a warm, fuzzy thank-you! I'm a tiny bit obsessed with paper straws. I'm not sure why. Maybe its because I'm a trend-follower, maybe it is because they are so colorful, but whatever the cause, I just love them. And when I saw red and green ones at Target I was inspired to put together this cute and simple ornament craft-it is so easy you can make it with your kids! -paper straws in whatever "Christmas" colors you want. I purchased mine at Target in the Dollar Spot. At 10 for $1.00 it can't be beat! Start by measuring and cutting your straws. I cut mine at 2 and 1/2 inch lengths, which gave me exactly three pieces per straw. However, you can make them as large or as small as you like, just be sure you have 8 equal pieces. Then you need to trim 4 pipe cleaners to double the length of your straw pieces, minus a tiny bit (less than 1/4 of an inch). Basically, this ensures that you don't have pipe cleaner sticking out of the top of the straws. Grab your pipe cleaners in the middle and twist them into a bunch. You don't need to twist too much, because you don't want a big lump. Just enough to keep them together. 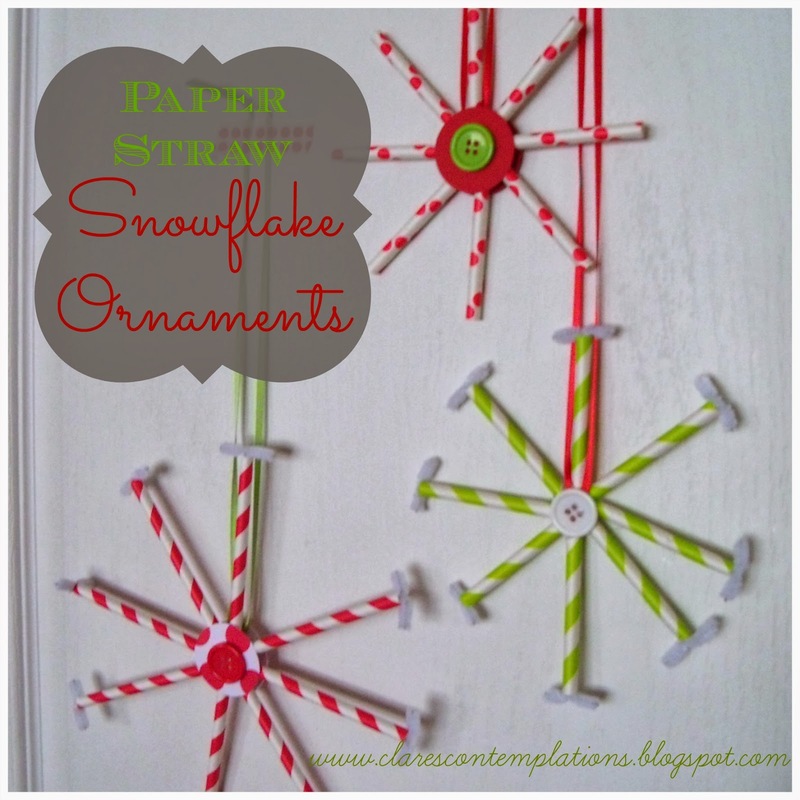 Spread them out into a rough "snowflake" shape. Don't worry about getting it perfect, you can fix it once you add the straw pieces. Pipe cleaners are forgiving like that! Simply slip your straw pieces over each pipe cleaner. There is no need to glue. Now you should have an eight pointed snowflake! Cut your ribbon double the length you want it for hanging and tie it securely in a knot around the middle. Line the ribbon up on either side of one of the straws, so it will be in place once you add the center embellishments. Add a generous dollop of hot glue, or tacky/craft glue if you are working with children, making sure it touches the bottom of all of the straws. At this point you have lots of options. You can use two paper circles to cover the center. You can add all kinds of embellishments on top of the paper, like rhinestones, buttons or ribbon. Or you can use a large button to cover the center. Basically, you just need something to cover the pipe cleaner twist in the center, and the glue that is holding it together. I used paper circles and buttons! If you would like to finish the "ends", cut a piece of pipe cleaner about 1 and 1/2 inches. You will need 8, one for each point. Fold it in half, and then take the top of each side, and bend that about halfway down, leaving it to point out horizontally. That will give you a "T" shape like this. You can place these into the straws at the end of each point. I just pushed mine in and they stayed just fine, but if you are worried about them falling out, just put some glue in the end of each straw and then put the pipe cleaner piece back in. I snapped a quick outdoor shot for you, but since it was 8 degrees and the wind was blowing sideways, it isn't too terrific! I got a better shot indoors. These are great tree ornaments, but they would also be cute package toppers, or embellishment for a wreath. You could even string them together to make a garland. I had the ribbon, buttons and paper on hand, but you use so little of these that even if you had to purchase them you would still have plenty left for other projects! They are quick to put together, so you can whip up a whole tree-full in no time. Quick, cheap, colorful and easy-that is my kind of Christmas project.